Ability to create an unlimited number of users to access the system, with its personal password, modifiable at any time. Authorized users are able to set what modules or features will be available for the other ones. Financial reports include each transaction record with the username that posted the transaction. 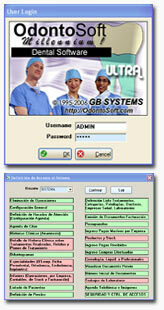 Ability to restrict the users access ONLY to patients of certain doctor. When setting the access rights for each user, you are able to select if this user will access to any patient or only to the patients belonging to certain provider. System Logs Audit: Complete report of LOG IN and LOG OUT times for each user to the system. Useful to get the exact time of work of each user or employee.